If you’re going to can your own food, you’ll need some tools. Don’t worry, the list isn’t long and I’ll put in pictures also so you know what you’re looking for. High acid foods like fruits, jams/jellies and tomatoes can be bottled in a Water Bath Canner or Boiling Water Canner (both the same thing). It’s basically a big pot with a lid and a rack to raise and lower the jars. 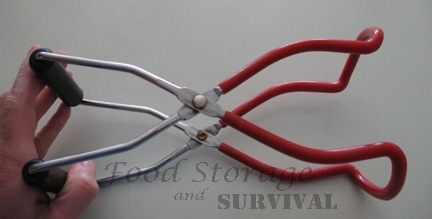 Low acid foods like vegetables and meats require a pressure canner. This canner has a lid that seals and has a pressure regulator on the top. It is nothing to be afraid of! Don’t leave it unattended, follow the directions, and you’ll be fine. 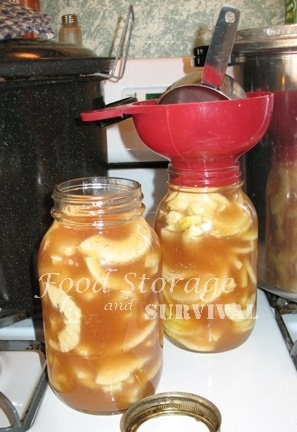 A canning funnel is a must for making things easier and less messy. 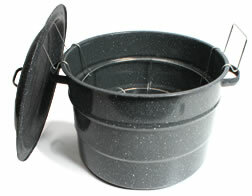 Seen here in action, it is a wide funnel that fits inside the jar opening. Perfect for loading your produce into jars. An absolute necessity for jams and syrups. The jar lifter is also a requirement. Use it to pull hot jars out of the canner. There are other tools like a magnetic lid lifter for pulling lids out of hot water to put on your jars, and a plastic bubble freer spatula thingy to get air bubbles out of jars before canning, but I’ve managed to get by quite comfortably just using a fork to lift my lids and a knife to free my bubbles, so if you want those other tools, go ahead and get them, they are probably nice, just not necessary. Last is a cooling rack. The jars cool off best when air can get under them. 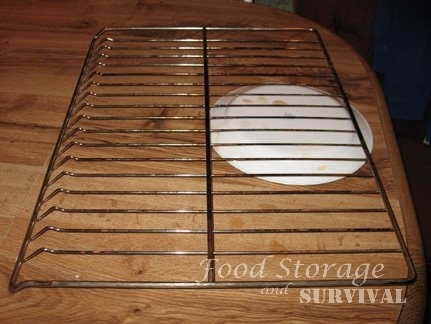 If you don’t have a real cooling rack that is large enough, you can make one (or two) with your oven racks. Take out an oven rack and turn it over. Then find something to prop up the opposite side that holds the rack about level. My mom used kids’ wooden blocks to hold hers up. My rack fits just right with a plate inverted holding up the other side. Easy and one less piece of equipment to keep around! Oh yeah, don’t forget jars, lids and rings of your choice. I’ve gotten my jars at yard sales, thrift stores, and from people who don’t can anymore, so I have a variety of sizes and some of each wide and narrow mouth. If I were to purchase all my jars, I’d decide on either wide (more expensive, but easier to load) or narrow (less expensive) and get all of one kind so then I’d only have to buy one kind of lid and rings. Just easier that way. You may be able to find some or all of this stuff cheap at yard sales or estate sales. Thrift stores can also be a good source. 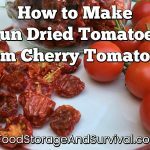 I have canned for years, but recently came up with a simple strategy that has made a real difference. I use wide mouth jars for items that can leave a difficult to clean residue inside the jar (mostly beans and meats). This way it’s easier to get inside the jar and scrub it clean. I also use wide mouth jars for vacuum sealing dried goods in powder form (brown sugar, powdered sugar, tomato powder, etc.) which I place in small ziplock baggies before placing in the jar. It makes it easier to stuff the baggies into the jar, as well as easier to pull them out when I need them. Regular mouth jars are for everything else.